This book will come signed by the author. 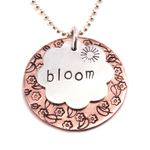 Metal stamping is one of the hottest trends in jewelry making. Using design or letter stamps and precious metal blanks, you can make personalized jewelry with words, textures, and creative designs. Lisa Niven Kelly, creator of the online Beaducation workshops and website, specializes in this simple, yet sophisticated technique. She has taught stamping for more than six years and will introduce you to the right tools and skills to help you create professional and exciting results. Stamped Metal Jewelry book and DVD teaches multiple metal stamping and texturing techniques, and the projects incorporate wirework andmetalsmithing to create fabulous necklaces, beads, charms, bracelets,cuffs, and earrings. The book opens with an extensive section onstamping, wirework, and metalsmithing tools and techniques. This section will give beginners the basic knowledge and confidence to move on to the next section which focuses on design. Nineteen projects cover a variety of techniques and designs such as creating charms, incorporating stamped links into beaded projects, making stamped links from flat wire and wire-wrapping them together, stamping on blanks and layering them, riveting, texturing metal, oxidizing, and more. In addition to Lisa's projects, the book features contributions by nationally known guest artists Tracy Stanley, Kriss Silva, Lisa Claxton, Kate Richbourg, Janice Berkebile, and Connie Fox. Yep, that's my book....wooo! Writing this book was a fabulous experience and I am super pleased with the outcome :) A big thanks to the amazing contributors for sharing their creativity! This book led me to the Beaducation website. The creativity in the book and on the website have provided so much inspiration for me! This book provides all the information you need to get started and hooked on stamping. LOTS off info. I purchased this book when I first decided to try stamping. I did not know about the site until I read the book. The information is presented in an easy-to-understand way and the illustrations are wonderful. This is a must-have for anyone who might be thinking of trying to stamp.